I installed two Jeld-Wen windows which are 24"x36" and purchased at Home Depot. The were attached directly to the framing and covered with the siding. I also used some sticky-backed window flashing type stuff they had to keep water out. I just followed the directions on the package. I installed a 30" pre-hung steel door and a lockset with a deadbolt. I used sheet metal flashing on the roof where appropriate. The exterior siding was caulked and painted. I added some 2x4 strips under the roof overhang to form a kind of eave. As for the interior siding, I considered using drywall. My issues with drywall were that it's difficult for one person to tote around and I'm a terrible drywall mudder. I can hang it okay and I understand the theory behind the mudding process but I'm just not good at it. My next idea was to just use paneling like in my folks house in the '70's. I went to the local HD and found real wood paneling was kind of spendy so I bought the cheapest stuff they had for about $11 a sheet. For $11 what you get is basically cardboard with a pattern painted on one side that looks kind of like paneling. I wasn't that excited about it but wasn't wanting to spend a lot of money on the "shed." Before I actually installed the "cardboard" I had an idea. 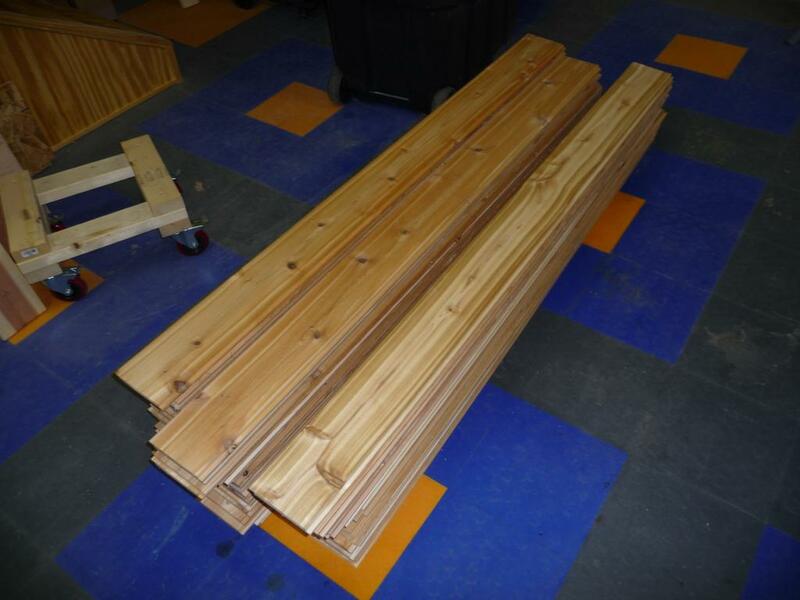 Home Depot sells these cedar fence boards which are 6' long by 5-1/2" wide for about $1.50 ea. on sale. I thought I could use them for the interior walls. The problem is they are very rough and the edges aren't very straight. I decided I could take care of that bought about 80 or so to test my theory. So I brought them home, ran one side through the planer to smooth them out, jointed one edge, trimmed the other edge on the table saw, and cut rabbits in both edges so I could overlap them during installation. 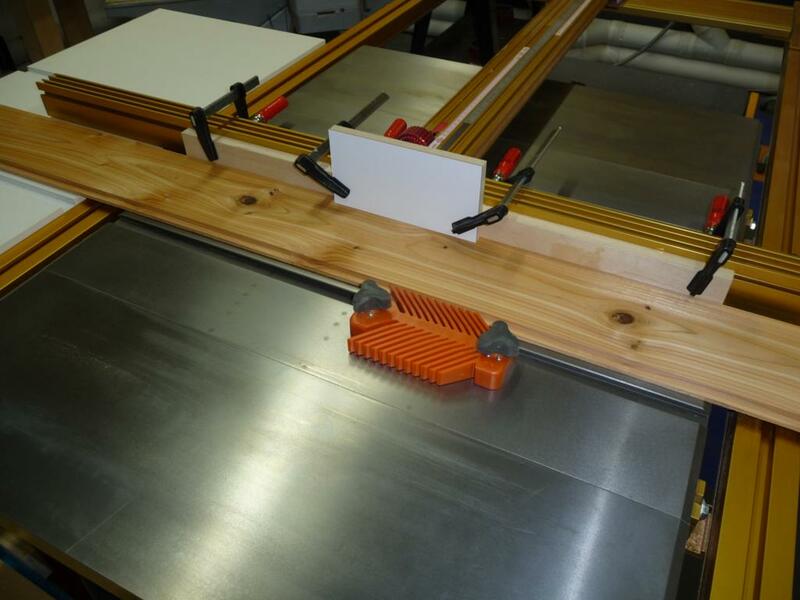 I also cut off the top of each board because they were angled at the corners like a fence board. The results were good. I was impressed with my ingenuity. 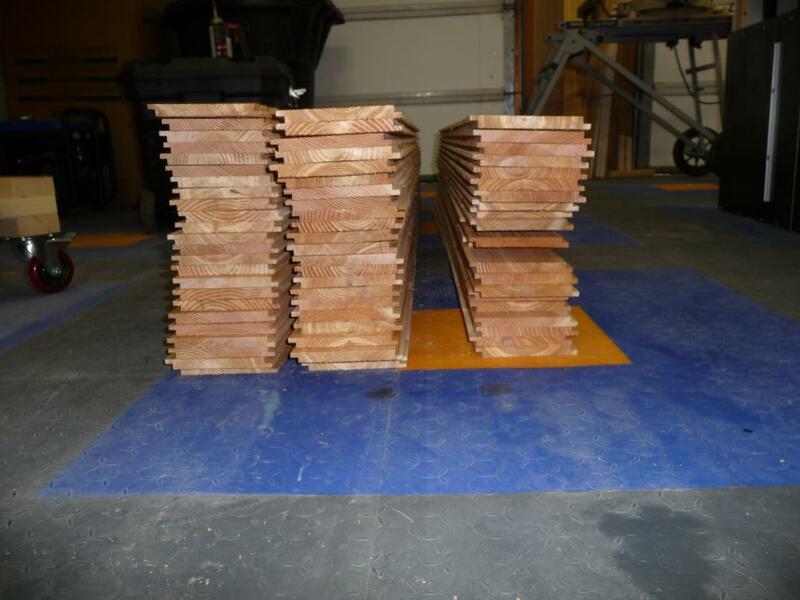 Over the next three weeks I purchased and prepared enough boards to finish the interior of the mini-cabin which was about 230 boards. It took forever to prepare them all and by the end I was wishing I had stuck to the cardboard paneling. 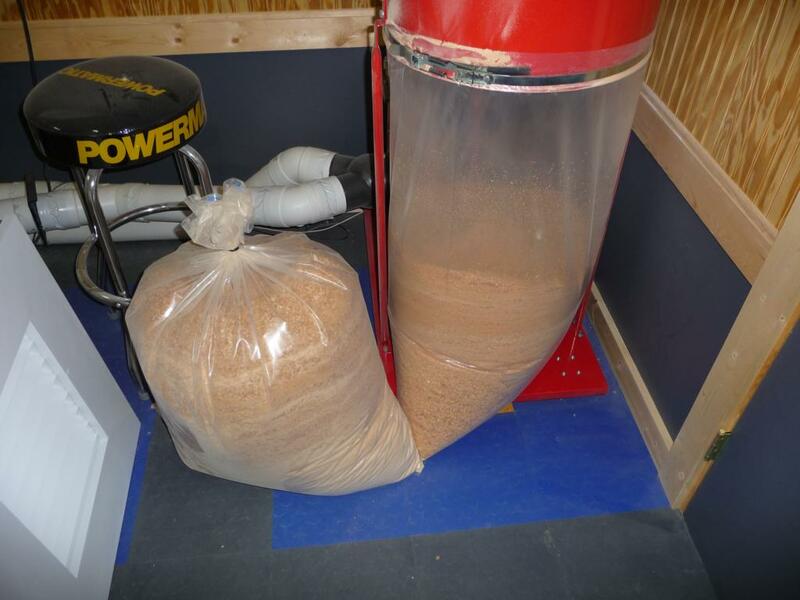 I had to replace planer blades once and change my dust collector bag about four times. I considered getting a hamster as I would have had a lifetime supply of cedar shavings for his cage. In the end, I'm glad I did it and it turned out well. Here are a few pictures of the first batch I prepared.